I recently had the opportunity to stay at the Park Hyatt Vienna before attending Megado 2017 in Europe. I had never been to Vienna before and since I had a few days before Megado started, I wanted to stay in the middle of the action. The Park Hyatt Vienna fit my needs perfectly. If you have ever read my blog before, you know I have much love for Hyatt and their product offering. I have their credit card which gives me annual free nights, along with the ability to use points for stays. This trip was booked online using points (25,000 points per night). I have found that I generally don’t receive the most glamorous room when booking with points, so I lower my expectations quite a bit. I was pleasantly surprised when I found that my room wasn’t in the basement and that it was beautiful! This room was simply stunning! It had lots of marble, with windows along the entire wall, letting in a ton of light to show off its elegance. The room featured an in-room safe, lots and lots of toiletries, a lovely sitting area and even a hotel-provided umbrella, which really came in handy. It, unfortunately, rained two out of the three days I was there. The Park Hyatt Vienna is actually a former bank building. The hotel used to be known as the Austrian Hungarian Monarchy Bank. If you look closely, you can still see how they’ve kept some of the bank’s features throughout the hotel. The location is perfect for sightseeing, as it is located in Vienna’s First District, which is within walking distance to several historical sights, such as St. Stephen’s Cathedral and The Hofburg Palace. I was able to visit both during my stay. I have to admit, I was feeling mighty pampered and appreciated after my stay at the Park Hyatt Vienna. I was greeted warmly at check-in and was left a lovely note and small gift in my room from management. After just a few times of leaving and returning to the hotel, the doormen knew me by name and always greeted me with a smile. Every employee I encountered was nothing short of professional and helpful. I never wanted to leave! But alas, all good things must come to an end. I will definitely return to the Park Hyatt Vienna when I have more time to enjoy all that it has to offer. Sounds wonderful! Moving to the NH for the MegaDo must have been quite the shock to your system. There was lots of shocking things to see at NH! 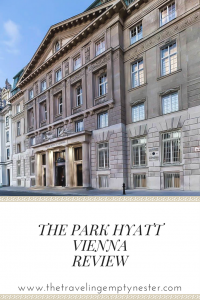 I really wanted to return to my ‘happy place’ at the Park Hyatt Vienna.